I’ve got our November salad in the books! This is going to be so much more than your thanksgiving salad. I mean, yes, it totally can be your thanksgiving salad, but it can also be your weeknight salad for the next three months. Don’t you love when I go and do that? Make something and claim you’ll want to eat it for twelve weeks straight? Swear it’s the best ever? Well. It is really fantastic! Okay so let’s talk about where we are going with this. Remember back in the summer when I recreated the Panera strawberry poppyseed salad? Well. I’ve been on a fuij apple salad kick (it’s so freaking good!) and I’ve wanted to recreate it at home. Then I got over that (well, I’m going to share it in January!) and decided that I just wanted to make a salad with apple chips. Apple chips are delish. And they are kind of like… apple croutons, if you will. How fun! That’s how I decided this is my thanksgiving salad this year and it is incredible. There is so much texture, flavor and variety. And if you’re over squash, you can leave it out! Here’s my thoughts on the squash. I love delicata squash (um, evidenced by the second recipe in one week that I’m sharing with it!) and using it here really turns this salad into a meal for me. Like a Wednesday night dinner in the fall and winter. On thanksgiving it’s not like we need (or want) our salad to be super satisfying. At least I don’t. I want to enjoy all of those traditional dishes that I only get once (or, err, if you have a blog – thrice) a year. So the salad on the table? I believe that it should remain light. 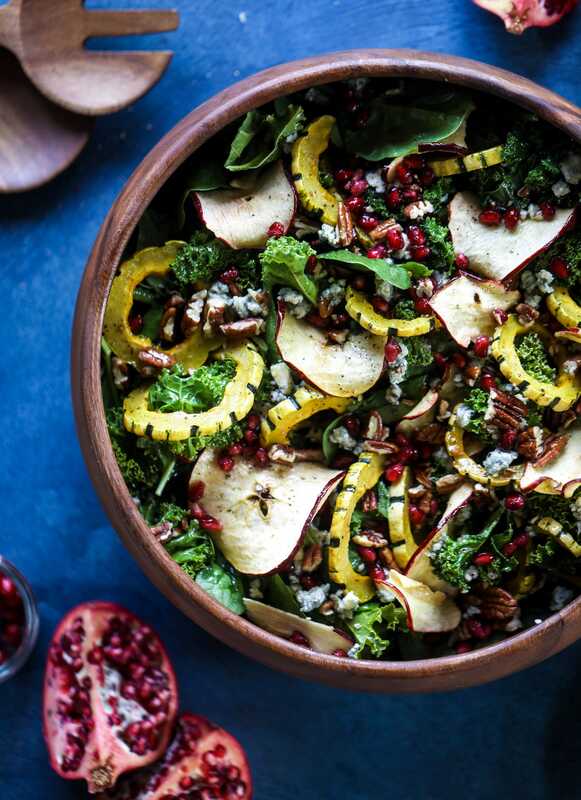 If you do this salad for friendsgiving or thanksgiving, I say skip the squash. It also saves you a step! The rest of the goodness? It’s amazing. We have a mixture of curly kale and spinach. I love the variety and texture! Pomegranate arils because hello it is November. Toasted pecans for crunch and flavor. Cranberry cinnamon vinaigrette that is straight up drinkable. It’s such a lovely seasonal salad that draws in both sweet and savory flavors. And it’s light enough that there is more than enough room for stuffing. And gravy! The best parts. 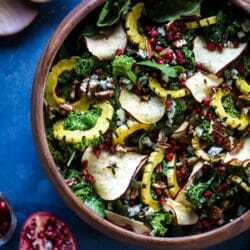 This Thanksgiving Salad is a lovely seasonal salad that draws in both sweet and savory flavors. The salad is light, but still has so much texture, flavor and variety. Preheat the oven to 425 degrees F. Place the squash on a baking sheet and drizzle it with olive oil. Sprinkle with salt and pepper. Roast for 15 to 20 minutes, until the slices are fork tender. To make the salad, add the kale to a large bowl. Drizzle on about 1 tablespoon of the cranberry dressing and massage it into the kale for a few minutes. Let the kale sit for 5 minutes. Add the spinach to the bowl with the kale and toss. Season with salt and pepper and toss again. Add in the squash, apple chips, gorgonzola, pecans and pomegranate. Toss well. Serve with the dressing! Whisk together the vinegar, juice, honey, mustard, garlic, cinnamon, salt and pepper. Whisk in the olive oil until emulsified. This keeps great in the fridge for a few days! I want to make this! For Thanksgiving, how much can I do ahead of time? Thanks! Wow really nice and awesome recipe with full of nutrients. As a Nutritionist I appreciate this recipe with all healthy ingredients. Many Thanks for posting this recipe, I will must try to home. 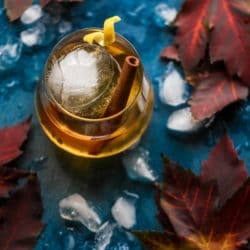 Love your blog, I’m a Pittsburgher living in the Hudson Valley & your blog makes me feel a little more connected to home! Salad looks incredible & I definitely want to try it for Thanksgiving, but we’re hosting a few non-honey eating vegans, Can I sub agave nectar or maple syrup for honey? Thanks & cant wait to see what you come up with next!!! Did I miss the directions for making the apple chips? Or is this something that you buy somewhere? Can’t wait to make this – I am delicata obsessed! If you’re not a Gorgonzola fan, do you think Feta or Goat cheese would be a good substitute?? I loved the texture in this salad! Thanks for sharing!